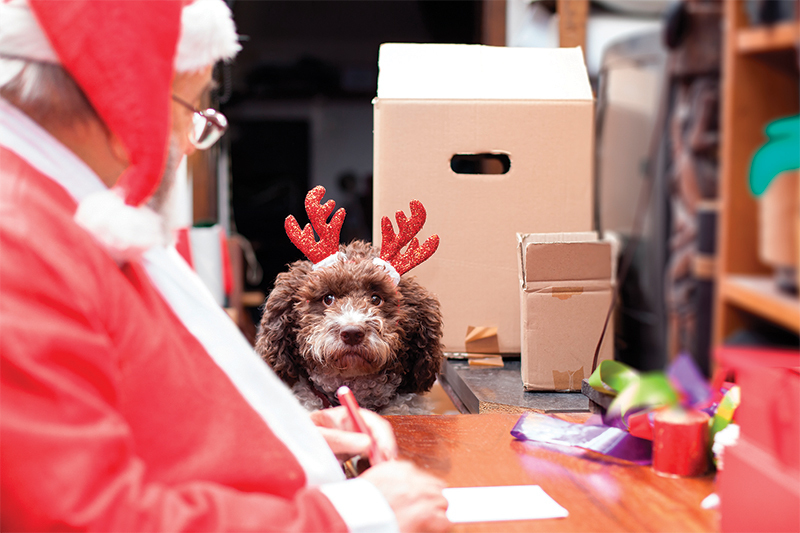 I just wanted to send you a quick note to tell you that I’ve been a very good dog indeed since last Christmas. I’ve hardly been naughty at all. You can definitely put my name at the top of your “nice” list. I have not barked at the delivery driver for three months in a row. I have not tipped over the kitchen trashcan, not even once, all year. And, guess what? I have not had any, ahem, accidents on the white carpet in the living room. One of the things I love about good dogs is that we are welcome pretty much everywhere in Vermont. Just the other day, in fact, I was out and about with my people, and, we ended up window-shopping for cool dog stuff. So, it occurred to me—does Santa need a few hints from me about my favorite things? A new collar is always nice and there are soooo many to choose from. I’d like to add a Ruffwear Knot-a-Collar braided rope collar from First Run Ski Shop in Stratton Village to my gift list, Santa. Or maybe the official Stratton collar and leash set, in deep red with the resort logo on them. It‘s from the Stratton Clothing Company. Everyone compliments me on it, and they know where I am from right away. Also, just so you know, I love going for my spa day for a warm, bubbly shampoo, a blow dry, ear cleaning, and pedi-pedi-pedi-pedicure with groomer Katie Lawrence at Katie’s K-9 Design in East Dorset. A gift certificate in my stocking would be grand! Just in time for Christmas selfies, Ann and Kaki at Pets Etc. of Vermont carry stunning formalwear for pets. Wouldn’t my friend Teddy look so doggone handsome wearing a fine, red plaid bow tie for his holiday portrait this year? And of course, for me something with major bling-bling-bling! Well Santa, and then there is—The Cat. She doesn’t get out much and would never, ever bother to write to you. But, if there’s room on the sleigh, you could bring her caahh-vee-ahh for her kitty stocking. The Cat purrs like a machine when she dines on Kitty Kaviar, from Pets Etc., made of heart-healthy, 100-percent shaved bonito, and rather gourmet. Oh, and Santa, on the gift tag for The Cat?…just don’t say those presents were from me, okay? Santa, you know that too many sweet dogs and cuddly cats spend endless days and nights at the local shelters, so—I never thought I’d be the one to say this!—The Cat and I have agreed that there’s room in our hearts for another furry friend. We’ll be giving a new forever home to a rescue pet right after New Year’s Day. Better bring us more toys! Give my best to the reindeer, the elves, and Mrs. S. Paws, too. Thank you, Santa! Have a safe trip to Vermont!